Crosby Lakeside Adventure Centre is inviting families along to this years Family Fun Day on Sunday, July 22. The Sefton Council run centre has lined up an exciting raft of activities to entertain all ages including free fitness classes, free water sport taster sessions, a bouncy castle, rodeo bull, BBQ, DJ and much more! There will also be an opportunity to book a place on the beginners sailing sessions planned for the day. This will give anyone interested a chance to get out on the water and try their hand at sailing. The fun day also falls on the same day of the fourth round of the 2018 British Jet Ski Championship which means there’ll be plenty to do and see. Crosby Lakeside Adventure Centre offers a huge range of indoor fitness activities including a variety of classes including Les Mills classes and virtual classes. The centre also opens a world of water sports activities on the lake including open water swimming, stand up paddle boarding, kayaking, sailing and more. 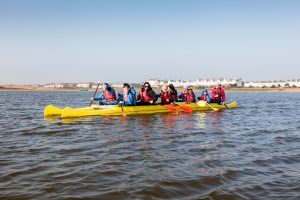 Cllr Ian Moncur, Sefton Council’s Cabinet Member for Health and Wellbeing, said: “Many people don’t realise just how much is on offer at Crosby Lakeside Adventure Centre. “This fun day is a brilliant opportunity for people to not only find out about, but also try their hand at the range of activities that are held at the centre. To find out more call 0151 966 6868 or like Crosby Lakeside Adventure Centre on Facebook.